In 1900, the St Nicholas Cathedral was established in the north-eastern Chinese city of Harbin. This monument of sanctity was destroyed in 1966 by the Red Guards during the cultural revolution. Rebuilt, it now stands as a symbol of the city's socio-cultural upheavals. The cathedral and all it represents is ressurected in the city's annual ice and snow exhibition. Harbin expresses its heritage in frozen form. With over 40 Harbin ice artists chainsawing, shovelling and cutting their way through mammoth chunks of ice, the Venetian has brought alive this ephemeral winter culture in the peak of summer, and even as the summer makes way for rain. The Winter Forest is a picturesque white landscape with frozen lakes and quaint bridges. Despite advanced freezing techniques, bringing a rush of northern chill to the sub-tropical south wasn't exactly as smooth as ice. Unlike in Harbin, where the artists work with natural ice and snow, in Macau they needed to be schooled to work with freezers, which themselves took about a month to build. In this time, lights, sounds and other effects were tested for functionality within the ice box. Though the carvings were completed to operational and structural integrity in a month's time, ten artisans are present in the hall at all times to ensure that all proceeds as planned. 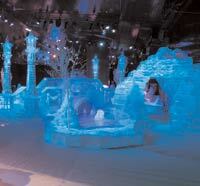 Spread across 1,656 sq m and crafted from 9,000 blocks of ice, each weighing 150kg, the exhibition turns the Cotai convention Hall F into a magical wonderland where minus 15 degrees celsius is room temperature. Once you've donned hooded coats and strapped on the winter boots that are offered at the entrance, you are ushered into the heart of this dimly lit, manmade cavern. The eerie glow of the ice grips you with its chills and thrills. The Slide Castle is flanked by ice slides. There are nine themed zones which begin with the glassy ruins of Macau's St Paul's Cathedral and Guia Lighthouse. These UNESCO World Heritage Sites capture the port city's intriguing past in their 110 sq m long icy facades and lead you through to installations of characters from the Chinese epic tale Journey to the West. History slips back and forth as you glide past Macau's sights to a recreation of Beijing's Temple of Heaven, enclosed in carpeted concentric circles that you can tread upon. 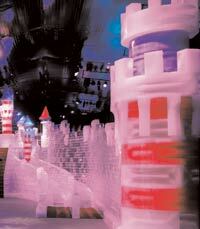 Unlike other ice displays around the world, the Macau Ice World is hands - and feet -on. It encourages you to touch, feel and experience the ice. "I guarantee that Macau has never seen anything quite like the Ice World." says Wolfram Diener, vice president of conventions and exhibitions at The Venetian Macao-Resort-Hotel. "With our mix of shows growing more diverse with every passing month, we invested considerable time and energy in discussing how we could bring something of spectacular universal appeal to our property and have found it with the stunning artistry of Harbin." Journey to the West is an allegorical rendition of the fabled Monkey Kingâ€™s life. The production and maintenance of the Ice World costed over US $1 million and the many worlds it crystallises within one hall more than justified that price tag. The crowning glory of the show is its largest and most elaborate structure, the multi-coloured Slide Castle. Sculpted to resemble a medieval English stone fortress, it covers 338 sq m and is 7m high. It is flanked by zigzag slides on two sides. Whooshing down these is just like hurtling down the Alps on a sleigh. Another ode to the past is the archetypal 20th century American-styled carousel that mimics reality in scale and design. Whimsical ponies and chariots are clustered in a merry- go-round that sports happy shades of pink and red. From the fantastic to the real, the next 201 sq m zone replicates the world's modern and ancient wonders such as the Eiffel Tower, Statue of Liberty, Big Ben, Roman Colosseum and the Taj Mahal. Harbin artists use food colouring to infuse dreamy pastel shades in their sculptures, to spectacular visual effect. The wonders dazzle in the dark. Temple of Heaven symbolises the ancient cultures of the Chinese Ming and Qing dynasties. Ice World may be manmade but it also pays homage to the natural landscapes of yore, with a winter forest and an ice age zone. The forest is mystical with frozen lakes and quaint bridges. The ice age showcases the fiercest mastodons, dinosaurs and other magnificent beasts of the time. The minimal use of colour gives these tableaus an eerie sense of the natural. And to prepare our senses for the natural tropical heat outside, there's an ice bar before the exit. With stools and counters swathed in ice, the bar serves a wide range of cocktails and single malts that are passed through a drink chiller, rendered in ice, of course. The cold spirits brace us for what lies on the other side. So, if you're looking to beat the heat without leaving these latitudes, don't head for the hills. Move over to Macau and heed the Arctic's call. Timings: 12pm to 8pm on weekdays and 12pm to 10pm on weekends. The exhibition is on till September 18 in the Cotai convention hall F of the Venetian.